Sunflowers galore – Mumma, Did You Know? I decided to harvest a few sunflowers today. I’m having problems with the moneymaker tomatoes and I was wondering if the sun flowers were blocking too much light. So with my toddler apprentice in tow, off I went to chop a few down. I managed to keep all falling flowers off the toddler, so that was a win. 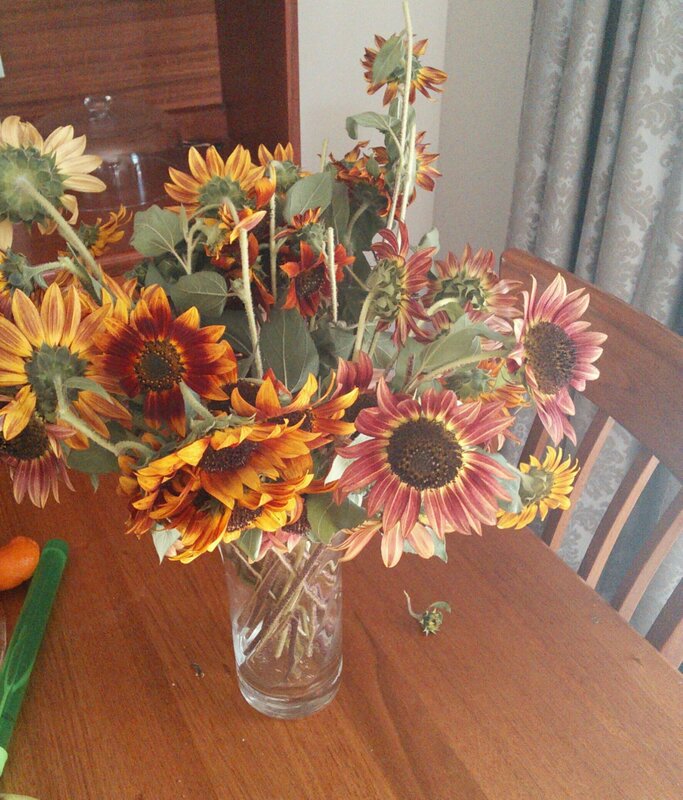 I chopped off all the flower heads swollen with seeds to keep aside for some local chickens, and found there were far more flowers left than I thought, so I started cutting those off too. I took the flowers inside and popped them into a vase. I am intending on trying to tidy them up. At the moment it kind of reminds me of my hair – big, a bit messy and out there but with lots of potential to look nice, if only I could figure out how.